Strawberry season has come and gone but we made it out this year in June to enjoy the delicious fruit. By the time we arrived one of the fields was already picked out. Fortunately for us, the farm opened a second field. We picked the small but very sweet Jewel variety. While I liked these candy-sweet berries, I will admit disappointment at not being able to harvest some bigger fruit with a little more tang. It was a seasonably hot day and I made sure to cover the kids and myself in sunscreen. These past few years I've also been wearing a hat. I used to be very self-conscious about it, but I soon realized no one really cares and I hated my head burning. My hair is not super thick and even 15 minutes in the sun can result in a painful burn. I found my hat at The Green Dragon, an open air flea market I had heard about in some of the Amish fiction that I read. That was a fun find. Here I am with my kids. 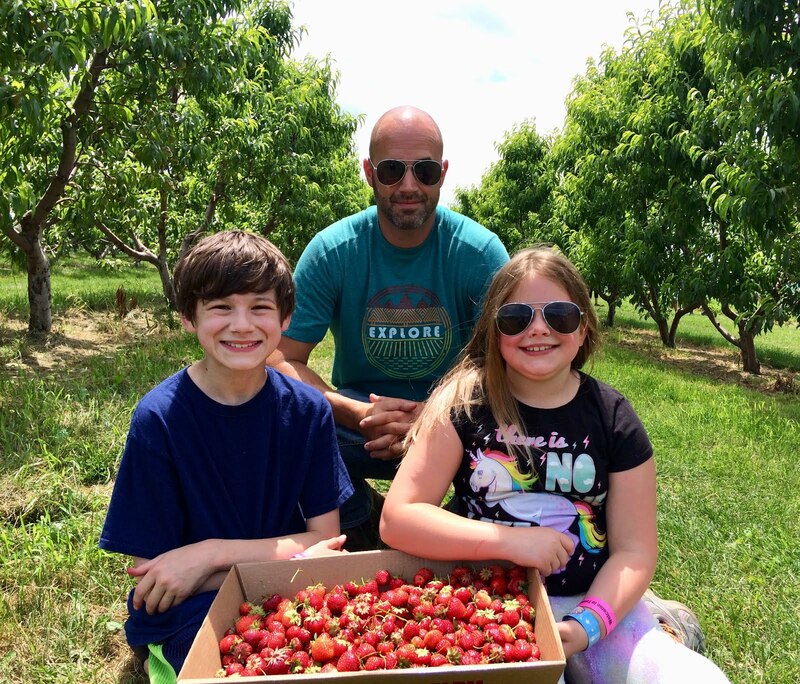 It was a fun day all around with sweet, fresh strawberries, strawberry doughnuts and strawberry cheesecake ice cream. We will be back again next year I'm sure! 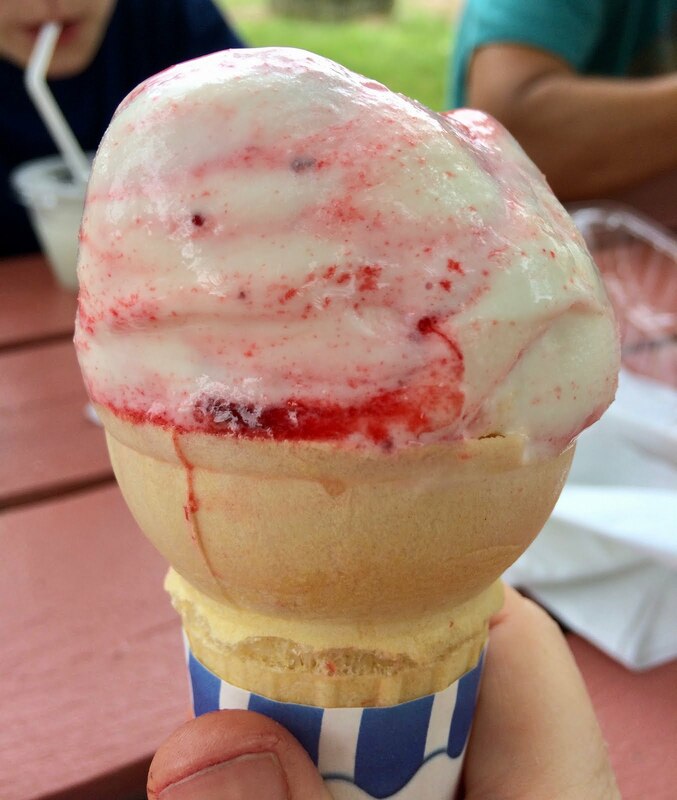 This strawberry cheesecake ice cream was so good! The stripe of jam running through it was absolutely amazing! Using some of the strawberries we picked, I made a small batch jam. You can find it here. 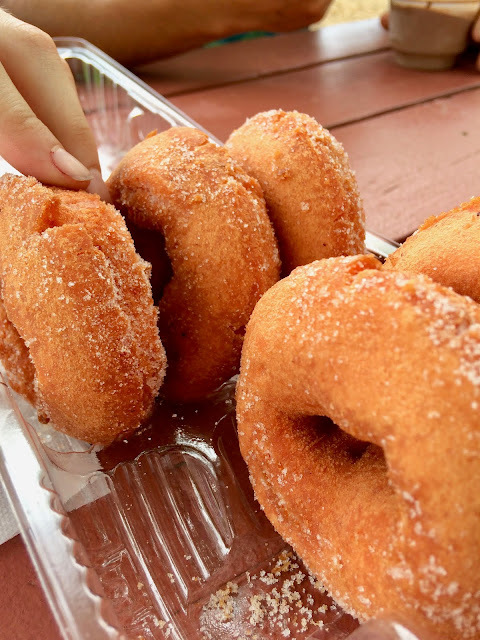 These strawberry donuts were just too hard to resist. Click here to see where we picked strawberries this year. We go other places some years but this place is by far the most entertaining. 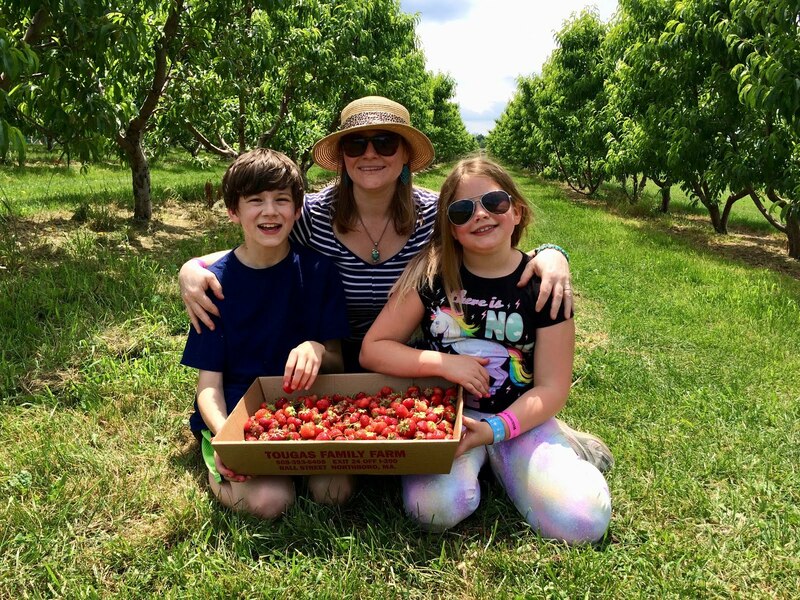 The day we went to the strawberry patch I knew I wanted to make some jam. But I also knew I didn't want to make a whole lot of it. In the past I've made far too much and we just don't eat it very often so I feel like it goes to waste. But I still wanted some jam. Just the right amount of jam. One jarful of jam. And I googled the word jarful. It's a thing. 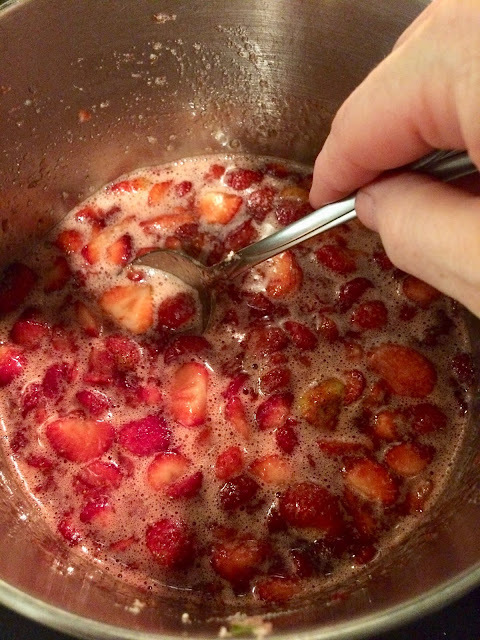 If your jam gets foamy you can scrape it off before you dump it in the jar. I needed to find a small batch recipe. So where did I turn? If you have read my blog for even a little while you might have already guessed. I turned to Pinterest of course. There were several small batch recipes and they were all very similar. I opted to use the basic bones of the recipes I saw, but halve the sugar and replace the rest with granulated Splenda. The result? 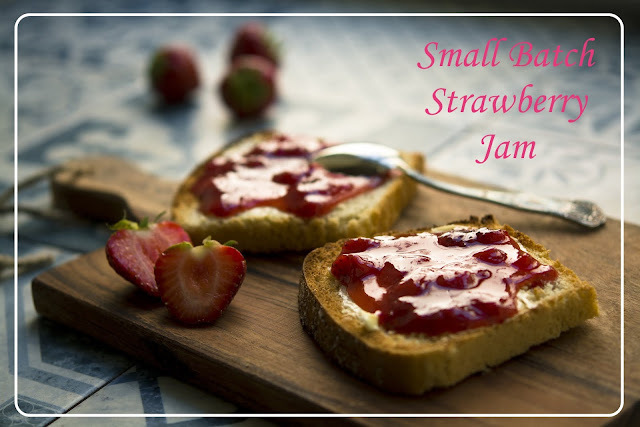 A wonderfully sweet jam with half the sugar of many recipes. We all enjoyed it very much. 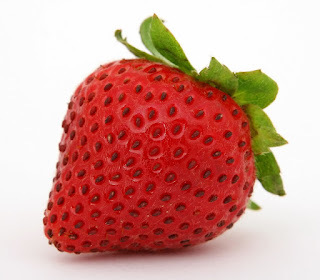 First wash and drain your berries. Then remove the stems. Next, slice the strawberries and add them to a medium sized pot. Stir in sugar and Splenda. Bring mixture to a boil over medium heat, stirring continually, then add lemon juice. Boil (and keep stirring!) until jam reaches 220 degrees on a candy thermometer. If you don't have one, it takes about 15-20 minutes of boiling. If you don't quite get to quite 220 the jam will be fine, just not as thick. Shortly before your jam is ready take a clean jar and fill it with hot tap water. A heated jar is less likely to crack when filled with hot jam. Dump the water out just before you add your jam. Once your jam is at 220, add it into the warm jar using a wide mouth funnel. Put a lid on it and let it cool on the counter. Once the jar is cool put it in the refrigerator and enjoy it within 2 months. The recipe came out great and I loved that I could easily sub in the Splenda. The recipes I saw did not recommend Splenda but I wanted a lower sugar recipe. I knew that I could not use all Splenda if I wanted the same sort of consistency so that's why I opted only to sub in half. TIP! You can try using granulated stevia if you want to avoid artificial sweeteners. TIP! 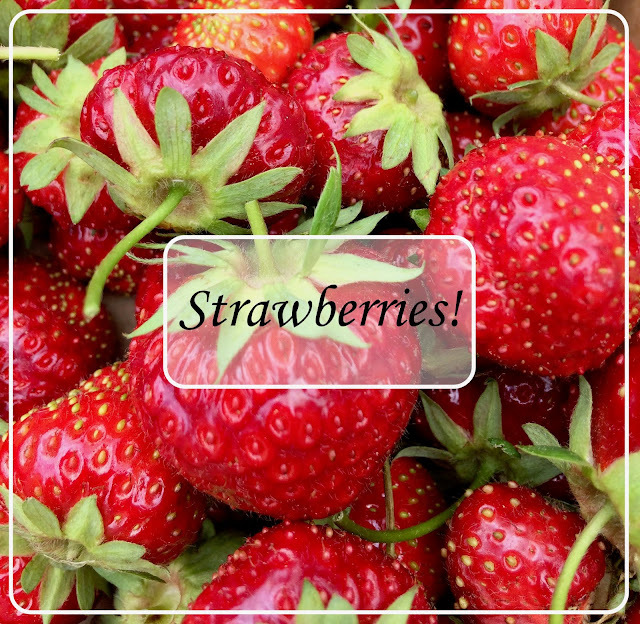 Use thawed frozen berries instead of fresh. Just measure them before you thaw them. Let me know if you like jam or if you try this recipe in the comment section below. What do you get when you combine an alien, Sasquatch and the Loch Ness Monster? 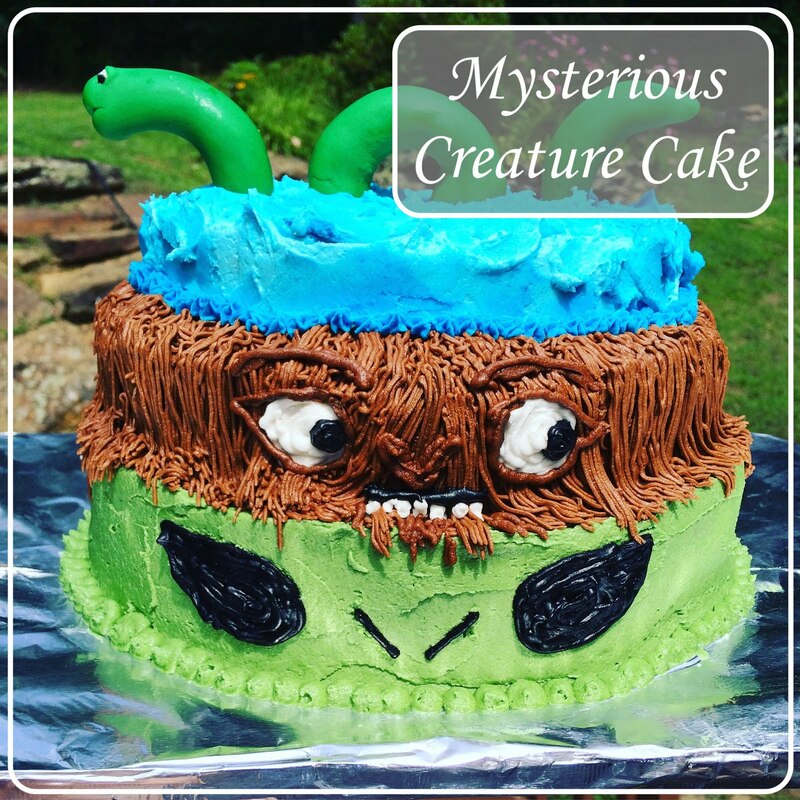 A mysterious creature cake, of course! I asked my son what he wanted to do this year for his birthday. My husband and I offered a variety of ideas and what he really wanted was an at-home family and family friend party. Nothing fancy. We could do that! 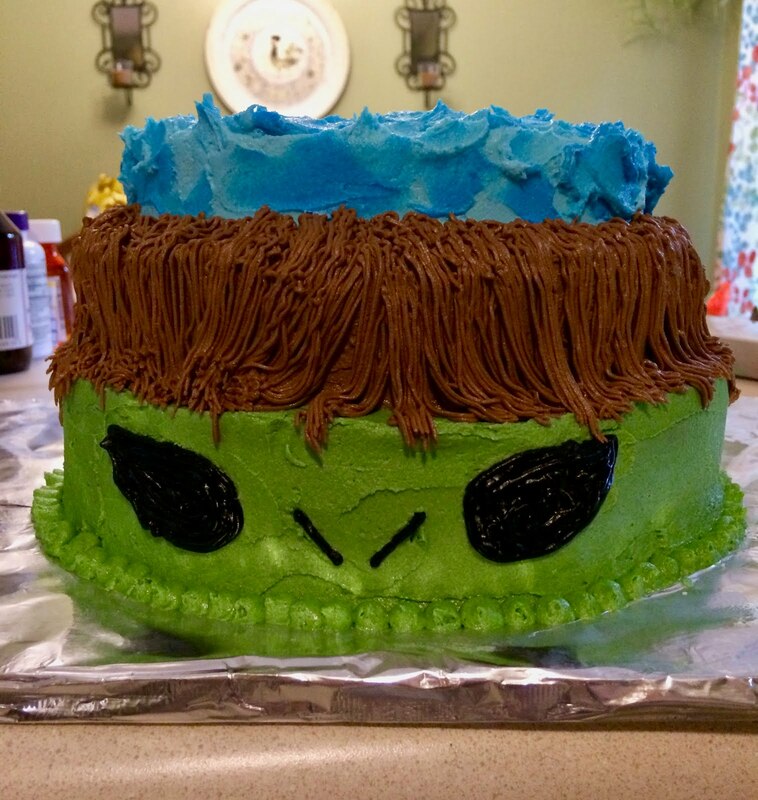 For weeks I asked him what he wanted his cake to be. He had some very lofty ideas that I wasn't sure I could pull off. His number one suggestion was the Himalayan mountains. Seriously? I told him to think of something else. A bit defeated, I think, he asked for repeat cakes, like a nature cake or perhaps a Minecraft cake again. I told him we could do the nature cake if he really wanted to, but I knew he wasn't very excited. So, the morning before his party I got up early, as I always do, and after a coffee and some quiet time adjusting to the new day, I got on Pinterest. I had to find something he really liked. Not finding any great ideas initially, I stopped, closed my eyes and listed in my mind all the things he really likes. Mysterious creatures! That was it! Now I had an idea. I wasn't sure if I would find any actual cakes but I typed a few different things in the search bar, hopeful. Lo and behold there was something. One thing to be exact. And I knew he would like it! Usually I leave my son alone in the morning to wake up slowly, but this morning I asked him right away if he would come and see the new cake idea. He was excited and this is the result! You can find the original design here. I made it close to the original with a few adjustments. And I am not sure who the original designer was because there is only a link to a picture. 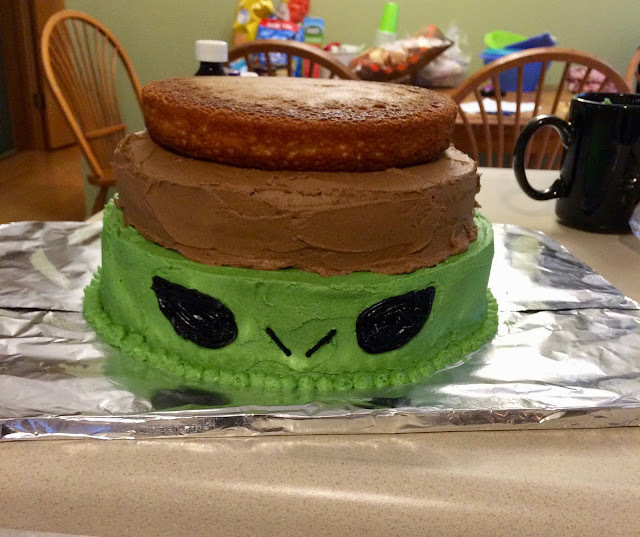 I used two boxes of cake mix to make this cake. The bottom layer I made in a spring form pan using one whole chocolate cake mix. This time I used Betty Crocker, but any cake mix or homemade cake will do. The top two layers are Betty Crocker yellow cake. After cooling the cakes on the rack and trimming off any uneven bits, I put down the chocolate layer and covered it in green frosting. I got this color with a mix of leaf green and moss green gel food coloring by Wilton. 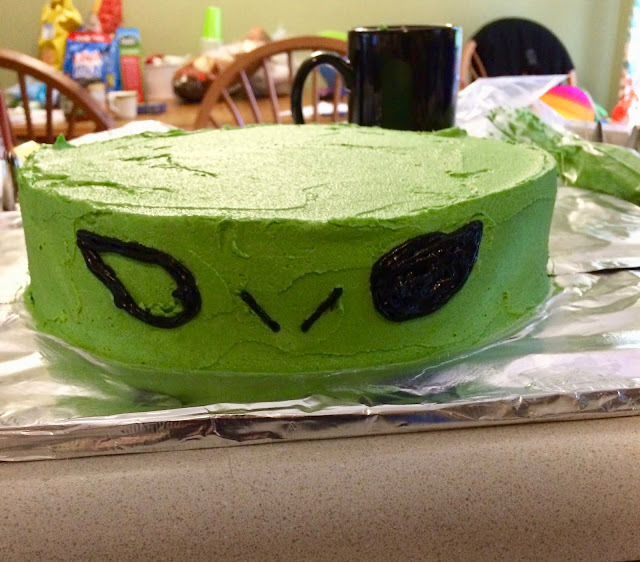 I then outlined the eyes and nose of the alien with a toothpick and filled them in with black frosting. Usually I make my own black frosting but this time I bought pre-made black in a squeeze tube because Walmart was out of black gel food coloring. The tube was so easy and the color was great. I may do this again in the future. The recipe I use for all of the frosting except the black, you can find here. It's the best one for decorating. It is a very rich recipe and one I use only for special occasions, but it works so well! As I said, the top two layers are yellow cake. They were made in pans of two sizes, I think a 10-inch and an 8-inch, but I'm not exactly sure on that. Either way, one is bigger than the other, but neither is as big as the spring form pan that I used for the bottom layer. After I frosted the bottom layer and piped in some dots for an outline, I placed the larger yellow cake on top. Next, I mixed up some of my vanilla buttercream with cocoa powder and brown gel food coloring. The mix of food coloring and cocoa made just the right color. I spread it over the entire second layer. I did not want to put the fur on my Sasquatch yet because I knew it would interfere with frosting the top layer. 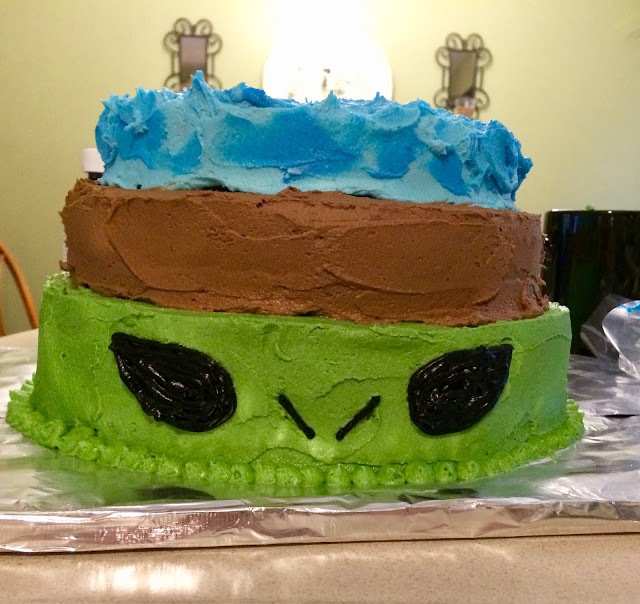 So I placed the next layer on top and frosted it with a layer of light blue frosting. I used Wilton Sky Blue. I didn't like it because it had no texture and didn't really look like water. Referring back to the original I saw they piped on waves. I tried that and hated it. So I opted to dye some frosting a shade darker and sweep it on to look like waves. Once the waves were done, I was ready to give the Sasquatch some fur. 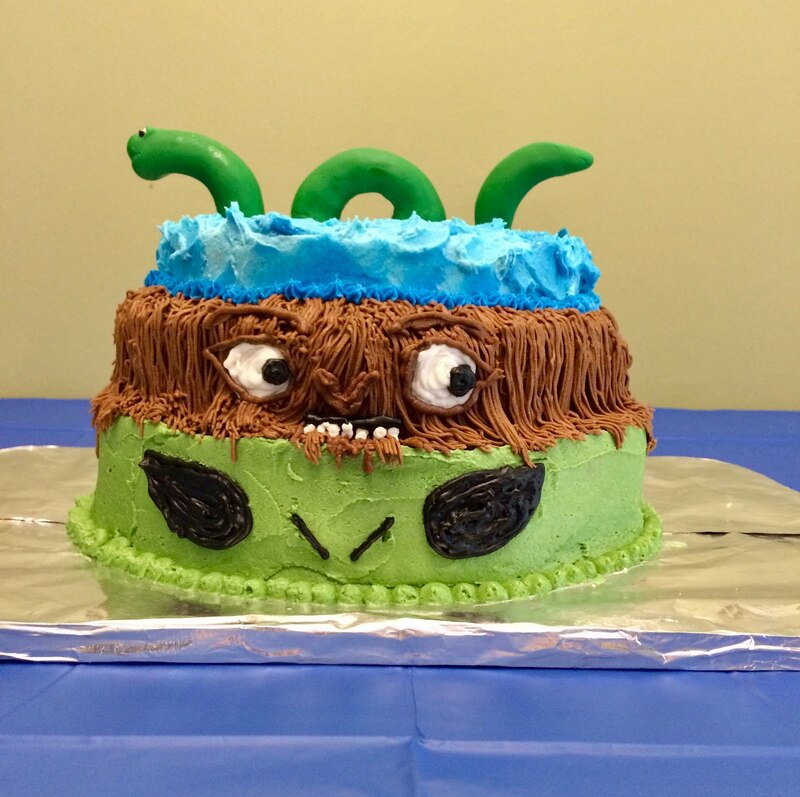 I used a grass tip for this and piped it on starting at the base of the blue cake, making long strands down to the alien. Next I piped some eyes, a nose and a mouth onto my Sasquatch and piped a border layer at the base of my loch. I let it sit that way overnight before I added on Nessie. I didn't want to have the Loch Ness Monster topple over and ruin the whole thing. To make the Loch Ness Monster I simply used pre-made fondant from Wilton. The night before I put it on, I shaped the fondant like play doh and tried my best! I put some toothpicks in the bottom of the fondant and draped it over a cylinder and hoped it dried properly. It did. I think it looks like more of a snake, but it works! They eyes I made by creating indents and piping on some white and black frosting. Right before the party I stuck Nessie on using the toothpicks I had inserted into the fondant the night before. So there you have it. If you don't know what to make for your 13-year-old who likes mysterious creatures, here you go! It's really not too hard! Comment below if you like to make creative cakes for your kids! Or maybe you have a question. Leave it below and I'd love to help!